Once a booming farm town in the heart of Sonoma County, Petaluma is turning a new leaf – catching the eyes of foodies, sustainability innovators and travel goers, alike. Downtown is lined with the facades of original Victorian-era buildings that are now home to award-winning cafes, farm-to-table eateries, breweries, yoga studios and artisan shops; and of course, the historic Mystic Theater (built in 1911). 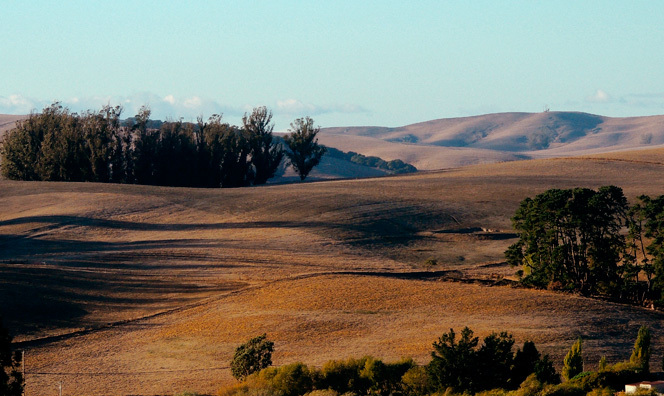 Whether you spend the day meandering alongside the Petaluma River, or venture out of town for world-class wineries, you’ll find Petaluma is the perfect home away from home during your SI courses. From the airport, follow signs for I-380 W / I-280 W / San Bruno. Continue on I-380 W, and stay right to take exit 5A for I-280 N toward San Francisco (which is almost immediate). After 5.5 miles, stay to the left to take exit 49B for CA-1 N toward 19th Avenue / Golden Gate Bridge. You will cross the city on 19th Avenue through Presidio Park. Follow the signs to the Golden Gate Bridge, as 19th Ave turns into Park Presidio Blvd, and then eventually US-101 N.
Cross the Golden Gate Bridge (no toll heading north), and drive the US- 101 N approximately 30 more miles to Petaluma. Turn left onto Middle Two Rock Road (note: this is the 2nd entrance to this road; make sure you’ve gone 8.1 miles). Drive .7 miles up a small hill, and the large iron archways saying “Rancho Strozzi” will appear on your right Please enter the driveway and proceed slowly and follow signs to the parking lot. From the airport, head south on Airport Road, following signs for I-880 N. Merge onto I-880 N toward Downtown/Oakland. Stay on I-880 N for about 9 miles; then stay right to I-80 E / I-580 W toward San Rafael/Sacramento. Watch for signs for the San Rafael Bridge / Richmond. Take exit 13B for I-580 W to the San Rafael Bridge (note: this is a toll bridge; cash only). Cross the bridge, and merge onto US-101 N. Continue 22 miles to Petaluma. Turn left onto Middle Two Rock Road (note: this is the 2nd entrance to this road; make sure you’ve gone 8.1 miles). Drive .7 miles up a small hill, and the large iron archways saying “Rancho Strozzi” will appear on your right. Please enter the driveway and proceed slowly and follow signs to the parking lot. Directions to the Dojo from Petaluma.